As readers of this blog or really any personal finance blog are aware, there are 3 particularly large expenses (housing, food, and transportation) that account for over 60% of household spending. We're focusing today on the madness occurring in the transportation category of the budget for many Americans. For those of you that follow my Twitter account, you may or may not remember a tweet from several weeks back about how the average new vehicle loan is $31,099, while the average used vehicle loan is $19,589. Furthermore, Americans on average spend 16% of their income on transportation. Although I do realize the necessity of a car in many areas of America (try getting to work in a small Midwestern town in the middle of January without a car), I also don't believe it's necessary to take on this kind of debt when purchasing a vehicle or to spend this much on transportation. Maybe I'm a bit biased as my father is quite handy with cars, and we have always purchased cars that were in collisions, and then restored them back to road condition. This has allowed us to use our cars for over 10 years at a relatively low cost in comparison to many Americans. I realize that this isn't something that is an option for everyone, but many Americans without a doubt would benefit from carefully considering their options when it comes to the transportation category of spending. I am fairly lucky to live 7 miles/10 minutes each way to/from work. The average American has a commute of 16 miles each way to/from work. With gasoline prices at an average of $2.85/gallon at the time of writing this, I spend $356/year on gasoline assuming working 50 weeks/year and 5 days/week, while averaging 28 miles per gallon. The average American would spend $814/year on gasoline with the same assumptions. Of course, the amazing part is this doesn't even factor in the other expenses that are magnified when one lives further from work. For instance, you'll need to replace your tires sooner, change your oil more frequently, and your car will depreciate at a much more rapid rate the further you need to commute to work. The other not so obvious cost is the added commute time that results from living further away from work. This cuts into your time to relax or pursue side hustles. Remember how I assumed that other Americans were also driving vehicles that averaged 28 mpg? It actually turns out that the average fuel economy in the United States is somewhat lower than that at 24.7 mpg according to Reuters. You're probably thinking "Kody, that's only a difference of roughly 13% in terms of fuel efficiency." However, when you drive as much as the typical American drives, it's that extra 13% in fuel efficiency that I'm getting out of my 2012 Chevy Impala that really adds up (I drove mostly highway miles, which is how I arrive at an average of 28 mpg for my commute). Of course, the average fuel economy of SUVs and trucks are still noticeably lower than that of subcompact and compact cars. With the strengthening US economy, stable gasoline prices, and improved design, the uptick in demand for SUVs and trucks has been drastic. Since 2008, the share of SUVs/trucks sold has increased from 49% of sales to 65% in 2017. Before purchasing a vehicle, be sure to evaluate your needs. Nothing is more illogical than to buy a spacier vehicle than you really need. It senselessly drains your wallet and leads to more carbon emissions in the process. One of the most useful things that I learned from both the online personal finance community, and my economics class is to incorporate opportunity cost into any decision you make. This will help you make an informed decision, and you'll ultimately feel confident in whatever decision you make after analyzing your options. For instance, let's say that you stumble across two barely used cars that are in nearly identical condition in terms of miles, model year, etc. The only difference is that one car is less desirable and perceived as "uncool" by society, whereas the other is viewed as a "status symbol" by society. The "uncool" and undesirable car costs $14,000, whereas the "status symbol" car costs $20,000. When determining which car to pick, it essentially comes down to how much you value validation from your peers. The $6,000 difference when invested for 15 years at a 5% inflation adjusted return turns into nearly $12,500. So at the end of the possible lifetime of both cars, we can see that one choice leads to you having $12,500 in extra wealth, and the other leads to $0. Live as close to work as you can provided it doesn't materially impact other spending categories like housing. This will save you time, and money provided you don't spend more on housing (living closer to work) than the reduction in your transportation expenses. If you are really lucky, you may even be able to work from home part of the week depending upon your job. Secondly, be sure to be mindful of your needs when evaluating what vehicle to purchase. How much space do you need from the vehicle you're looking to purchase? What is the fuel efficiency of the vehicle as measured by mpg? What are the safety ratings of the vehicle? All these factors should be taken into account prior to pulling the trigger on purchasing a vehicle. Lastly, be sure to weigh the opportunity costs of one vehicle against the other. Is a prestigious or unnecessarily spacious vehicle that is priced higher than a reliable, workhorse vehicle worth amassing substantially less wealth 10 or 15 years from now? 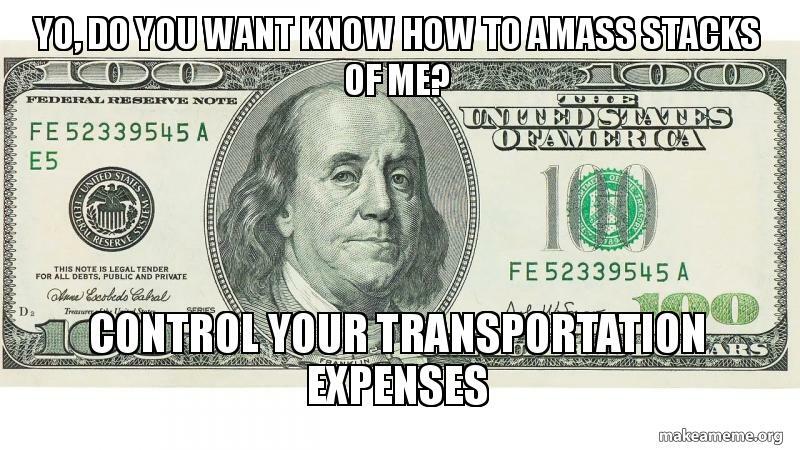 What are your thoughts on the transportation expenses of the average American household? 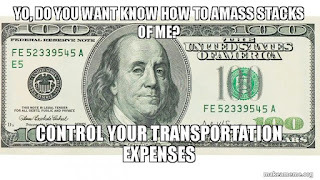 Do you have any tips that you can think of to reduce transportation expenses?